I went to a giant US post office in midtown Manhattan last Saturday to ship a package. Watching the postal workers behind the counters was painful. They moved at the speed of a slug on crutches, as though their bodies hurt, not embarrassed that people in the growing line could see their lack of purpose. They all looked to be well under 40. I sent three small packages that were promised for February 15 arrival. One reached Westchester on the 16th. By the 18th the ones to Massachusetts and New Hampshire were still in transit with no activity on the USPS tracking site since the 14th. Not fun typing in 22 digits for a few packages every few days. On the 18th –still no activity on the tracking site–I called customer service and decided not to wait the estimated 29 to 45 minutes to speak with someone who would no doubt reiterate what I already knew: The packages are “in transit.” So I went to the post office and an obliging young woman disappeared to check online as I’d done, learned what I already knew and told me to file a claim online. More work. Joy. I got busy, it was a holiday weekend, and I remembered to look again on February 21. 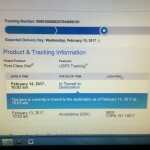 One package arrived in New Hampshire that day; the other arrived at the zip code “hub” where my friend lives. She reported that it also arrived at her apartment. How is it that LL Bean can get me a package UPS Ground from Maine two days after I order an item—[and doesn’t charge a cent for shipping]? Have you noticed that the less business it gets, and the more technical tweaks it adds, the USPS, once an essential, reliable personal and commercial communications partner, increasingly disintegrates? Do you still use it? When you do, how many days/weeks do you give to get a letter or package to someone on time? 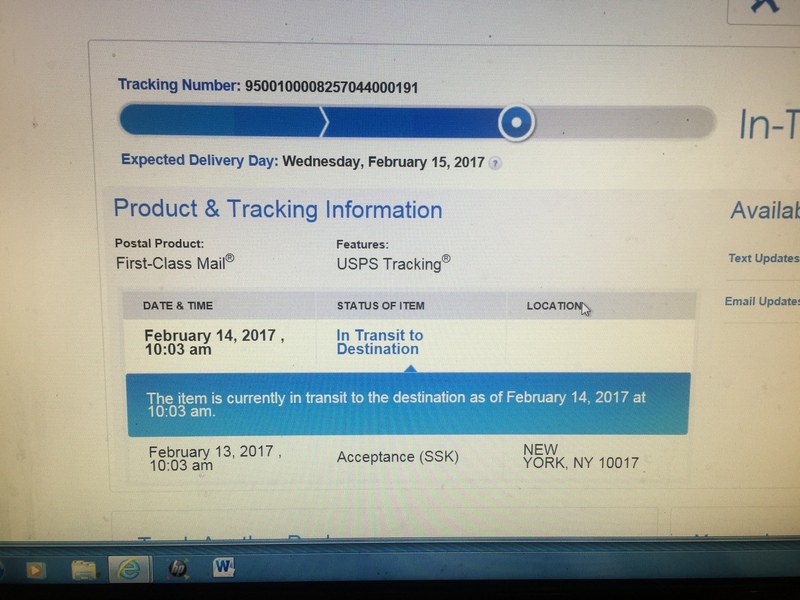 This entry was posted on Monday, February 27th, 2017 at 11:35 am	and is filed under Post Office, Shipping	. You can follow any responses to this entry through the RSS 2.0 feed. You can leave a response, or trackback from your own site. Jennifer wrote on Facebook: UGH! I completely agree!! USPS is getting worse and worse. The employees don’t care because they know it’s a failing organization. I think the local centers are a bit better (sending something from the Manhattan UES branch would take twice as long to send as a suburban NY branch) but not by much. I once sent a friend a letter with a small bag of candy inside the large envelope – she got the torn up letter and envelope, but some postal worker somewhere was enjoying the candy! I have been in this position with a failing magazine and we all worked double hard to try to save it so while I agree with your analysis, I can’t understand the employees. Our office mail delivery person is the exception. His name is Larry. He is bent in a U-shape due, I suspect, to arthritis or some such and he is always pleasant, offering to take mail from you if he sees you carrying letters in the elevator. He never complains though he must be in pain. Ours is not the only office building he covers. I recently was the victim of suspected credit card fraud, but I suffered no loss because I was alerted by the bank to suspicious activity on my account. The bank was quick to close my account and open a new one in my name. But it took the bank 10 days to get a new card into my hands, which I blame on the bank, not on the post office. Instead of using overnight mail, the bank used “pre-sorted first class mail,” and advised me to allow “5 to 7 business days” to receive my card. A quick look at the calendar indicated that my wait could be two weeks, including two weekends, one of which included the Presidents Day holiday. I was fortunate that the new card missed the holiday weekend by 24 hours, but it was still slow service. My point is that the bank made the choice, not the post office, knowing that the service would be slow. The decision tarnished an otherwise praise-worthy action. It shouldn’t take 10 days to get a letter from anywhere in the US, except if it takes a few days for the bank to accumulate enough mail to pre-sort before any of it reaches the postal system. You are right that the bank chose the slowest, least reliable option. In the case of my packages with promised arrival on Feb. 15 and actual delivery Feb. 21 my suggestion is that they should make no promises…raise zero expectations. The problem may lie in overpopulation and understaffing in large urban centers, where things may come to a temporary standstill with a negative ripple effect throughout the countryside. Local mail in this neck of the woods (Mount Kisco) arrives the next day, and it’s been known to show up even on the same day it’s been posted! A cumbersome system, not the fault of local post offices, exists when it comes to neighboring and even abutting towns. Instead of being shipped directly to the town next door, mail travels to the county center (White Plains) and returned to each municipality. Despite that, service is pretty good, with mail arriving from hundreds of miles away often showing postmarks of the day before. Everyone has a mail horror story to tell (me too) but given the trillions of pieces being shipped in a tiny window of time, USPS can be cited for doing a good job. I worry about the USPS, and know it is a source humor and complaints, but everyone is entitled to it. I use it for mailing books and cards, but not necessarily every week. I still look forward to mail delivery at home and at work. We really do get very helpful service for delivery and at our local Post Office. I do not want it to be totally eliminated by for- profit companies that guarantee speed of delivery that may put their work and the public at risk. I realize that this sounds antiquated, but it is genuine! I don’t want the USPS to disappear! I want it to shake itself up, turn things around and earn its keep as well as to set the standard for–not lag behind–the competition. I want it to be reliable. As I mentioned in my response to Anonymous, I suggest it NOT make promises it can’t keep. It should not take weeks for a Valentine to get from Long Island to California–or to be more precise, not seem to arrive in weeks and weeks. E-cards are fine and I’m grateful for anyone who thinks of me or us and sends one but there’s nothing like a pretty card to put on display for a while. The morning I ran into a snag at Grand Central and reported it in a recent post the place was almost empty. With the exception of holidays, it gets busy at lunchtime and at the end of the day. Not all workers there are grouchy. Some do their best. There are many valiant workers like Larry whom I mentioned in my comment to Jennifer P.
Terrific that service is so good within your neck of the woods. For that reason I try to mail things from upstate but haven’t been there for a while. Seems that, just as you describe it, mail from Dutchess County goes to Albany and then back to an adjacent town. I mail a fraction of what I did in the past so infractions glare back at me. You’d think that postal workers might handle the relatively small amount of business they have more efficiently. So glad to hear from you, Martha and Lucrezia! There’s hope for the old girl yet. I do think that Banks are miserly and foolish about postage for replacement cards or documents. I know that morale may not be superb at USPS, but not all workers think their job is coming to an end. Security problems have made all mailing and shipping more complicated and tedious. We often use USPS for business shipments sent to and from Japan. EMS continues to be efficient, competitive and reliable for this purpose. Artwork has never fallen off one of their trucks in transit to never show up again nor has the USPS delivered costly artwork gauged and destroyed despite plywood packing and an enormous shipping fee. We are always amazed that handwritten mail gets delivered to any country that uses a different alphabet. It seems wisest that we continue to have multiple options available to satisfy our needs. I agree: The more options–the more competition–the better. I also wonder whether postal workers in cities think in terms other than personal ones i.e. when will they retire, not whether the USPS will close down. Of course I can’t speak for others. I imagine that in tiny offices in rural areas there is fear that their office will be merged with others in adjacent towns. All the more reason to bend over backwards to be nice and helpful so that members of the community push for you to be the one to keep your job. Although related to motor vehicles, not the post office, I remember my nephew telling me how shabbily he was treated at the motor vehicles office nearest the auto body shop he owns. He was there often. When there was talk that this office might be closed, suddenly staff fell all over itself to greet him warmly and wave him goodbye. I just received a note in the mail from someone who lives about 20 miles east of me on Long Island. The note was postmarked ten days before it arrived. The sender could have walked it from her home to mine in less time! Clearly there’s something up with LI–maybe your Valentine’s are stuck there too. Westchester, at least in Lucrezia’s experience, seems to be humming where mail is concerned and NJ works for ASK. I forgot to check the postmark on a birthday card that arrived yesterday [Wednesday] for Homer. His birthday was Saturday but the mailer may have sent it late.